Forged in Steel was crowdfunded in 2015 and released late last year by smaller publisher known as KnightWorks. It definitely deserves a wider audience than it’s received so far. It’s a city-building game, with worker-placement and some economic engine mechanics rolled in, but also thematically well-integrated. It fulfills its concept of players building out across the board and exploring multiple paths to victory while also frequently sticking it to their opponents. 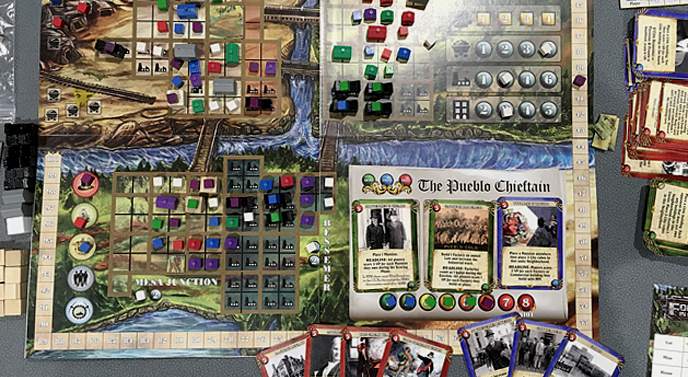 Players in Forged in Steel represent the opportunistic (and sometimes outright sleazy) developers in the mining boomtown of Pueblo, Colorado around the turn of the 20th century. They build in the five distinct neighborhoods outside the town, mostly constructing houses but also commercial buildings, factories (only on designated spaces), parks, civic buildings, hospitals, or mansions. One catch is that the player can typically only build on a lot that is already owned, with a player’s token or a neutral city token on it, essentially making the lot as zoned for development; if you build on a lot owned by someone else, that second player gets a victory point. There are also mines available for ownership, which don’t require development but do award points, both when the player first builds them and then during the scoring of each round. The meat of the game is in the cards each person plays over the course of the game, typically five in each of the three eras. There’s a multi-stage selection process that lets you ‘bank’ cards to play in a later era, and in each round the player who takes the City Planner role gets to draw additional cards, choose one to keep, and pass the remainder around. You can use a card for its point value to build stuff or to seize someone else’s building (a good late-game strategy to swipe points from the player in the lead), but most of the time you’ll want to employ the card text, which often lets you accomplish more than you could with the three to five points the card offers. 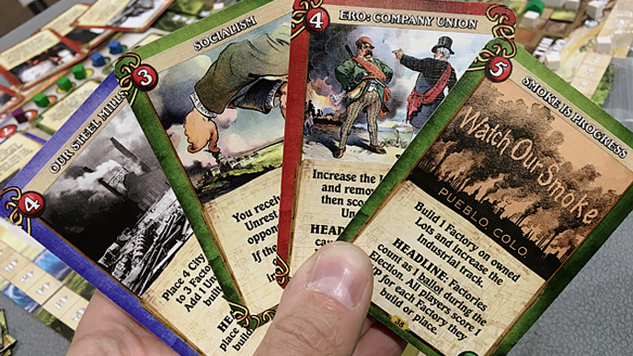 Many cards are also Headline cards, which are then played to the ‘newspaper’ area of the board, and then affect game play and/or scoring for as long as those cards are active; there are only three such spaces, so playing a fourth headline card bumps the oldest one out of the queue. Some headline cards affect everyone equally; some affect only the player who played the cards, and some affect only the player’s opponents. You’re tweaking the game’s rules as you go along, which requires a nimble strategy and forces you to hedge your long-term plans. It also is one of many balancing factors that keeps one player from running ahead too quickly. Players also take on character roles during each era, including the Mayor, who is decided by an election process that might be uncomfortably familiar to Americans right now: ballots are tallied by neighborhood, based on each player’s’ houses and mansions, and each neighborhood gets one or two electoral votes. The player with the most such votes is the Mayor in the next era, and the Influence track is determined by the entire results of the election. In most cases, it’s better to be higher on that track, as it’s used to break ties and sets the order for card choices and house placement during the Immigration phase. Yep, there’s Immigration here, but no bans or visas. At the end of each era, the city’s growth determines how many new houses it will need to house new immigrants, from one to three houses per player, plus one more. The trick is that players can only place these houses on lots that already have ownership cubes, and if there aren’t enough such spaces, players will have to add a cube to the Unrest track – potentially leading to a riot and destruction of several properties – for each house they can’t place. The player who took the Immigration Officer role gets to go first and place those one to three houses plus the extra one, followed by the remaining players in Influence track order, so the last player to go is the most likely to be unable to place enough houses. That Unrest track is another balancing feature of the game; once it reaches eight, the player with the fewest cubes on the track gets to start a riot and must target the player with the most cubes on the track. The instigator gets to roll the game’s four-sided side and destroy that many buildings (plus one or two for later eras), starting with one owned by the target player and then expanding to adjacent buildings. There are various cards that let you clear cubes from the Unrest track or otherwise reduce the chances of a riot, but sometimes a little mayhem is good for the soul – and for keeping the scoring close. The main knock on Forged in Steel is the complexity of that scoring round – there’s a LOT of counting here, and while the scoring system makes sense, you’re going to spend some time counting up points. It’s probably a good idea to have one person count the points out loud and at least one more checking it, because it’s easy to miss something. You score for each mine you own, each factory you own, and each commercial building you own, with the points per building determined by the scoring track for that building type. You score for houses in two ways: once for the house itself, which is one or two points depending on the neighborhood’s track, and then again depending on what it’s next to, adding a point if it’s adjacent to one or more special buildings but not if it’s adjacent to a factory. You score for your mansions, two points apiece plus one for each of your houses adjacent to it. And there might be points bonuses on the active headline cards as well. Forged in Steel plays two to four, but the interaction component is much stronger with four players, as is the competition for certain key spaces on the board (especially the mines). The listed game time of 90-120 minutes is probably a little optimistic; our first four-player game took over two and a half hours and I don’t think you could get it under two unless all players were experienced. The rules might be intimidating the first time around, but there actually aren’t that many rules to remember, and when you strip it down to the basics, each player will take 15 turns over the course of the game, 5 card plays per era, plus three Immigration rounds of straight house placements (or unrest). And I think it’s a testament to the design that that first four-player game, where no one had played before, finished as close as it did: 188 to 186 to 186 to 182. If you’re into long, complex strategy games – like Le Havre and Scythe and Terraforming Mars- Forged in Steel should be on your to-play list.